From left, Deputy Prime Minister of Sweden Isabella Lovin; U.N. Secretary-General Antonio Guterres; Manuel Bessler, head of the Swiss Humanitarian Aid Unit; and U.N. Undersecretary-General for Humanitarian Affairs Mark Lowcock attend a news conference after the High-Level Pledging Event for the Humanitarian Crisis in Yemen, in Geneva, Switzerland, April 3, 2018. U.N. Secretary-General Antonio Guterres urged the warring sides in Yemen on Tuesday to reach a political settlement to end a conflict that is now in its fourth year and has left 22 million people in urgent need of aid. His special envoy, Martin Griffiths, will head to the United Arab Emirates, Oman and the Yemeni government-held city of Aden in the drive for peace, Guterres told reporters. Griffiths has already held talks with both sides in a war that has drawn in regional powers, meeting Houthi authorities who hold the capital, Sanaa, as well as internationally recognized Yemeni President Abd Rabu Mansour Hadi and Saudi officials in Riyadh. Guterres said he saw "positive perspectives" for preparing a plan of action "to lead to an effective inter-Yemeni dialogue able to achieve a political solution, with of course the involvement of all those that are relevant in this conflict." "I am optimistic about that possibility," the U.N. chief added. Guterres was speaking on the sidelines of a U.N. pledging conference a day after an airstrike by the Saudi-led coalition that supports Hadi's government killed 12 civilians in the coastal city of Hodeida. Houthi forces later targeted Saudi Arabia's southern border area with a missile. He announced that more than $2 billion had been pledged toward a U.N. humanitarian appeal of $3 billion for Yemen this year. It includes $930 million from Saudi Arabia and the UAE, which lead the coalition airstrikes. When the Houthis fired missiles at Riyadh last November, the Western-backed coalition responded by shutting Yemen's airports and ports. The United Nations said that blockade raised the danger of mass starvation and it was partially lifted. 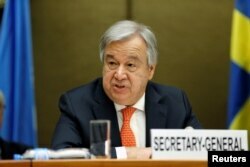 U.N. Secretary-General Antonio Guterres talks during the High-Level Pledging Event for the Humanitarian Crisis in Yemen, in Geneva, Switzerland, April 3, 2018. Most humanitarian aid enters through Hodeida, but the government accuses Houthis who control the port of smuggling weapons through it. "We need to find the ideal solution, which is a return to the talks table, to put an end the war, to return to a sustainable system supported by the people of Yemen," he said. The U.N.'s World Food Program is providing food rations to 7 million Yemenis, up from 3 million last year, Elisabeth Rasmussen, WFP assistant executive director, told the talks. But Dr. Nevio Zagaria, the World Health Organization representative in Yemen, said that child malnutrition rates were rising. About 1.8 million children under age 5 are acutely malnourished while 400,000 suffer from severe acute malnutrition, which can be deadly, he said. was 6 months old. Its twin died the week before," Zagaria told Reuters. After more than 1 million Yemenis were found with apparent cholera last year, WHO is shipping vaccines to avoid a repeat of the epidemic that killed 2,267 people, he said. Some 1.4 million doses out of 4.4 million planned are on their way via Nairobi. "The rainy season is starting, so we need to use the window of opportunity to start a vaccination campaign," he said.